According to the World Health Organization (WHO), three billion people – or half of the world’s population – cook their meals indoors over biomass-fueled open fires. Not only is the majority of this heat wasted, 20% of it is converted into toxic substances like carbon monoxide, benzene, and formaldehyde. In India alone, 500,000 people die annually as a result of indoor air pollution (IAP). Disproportionately, the majority of these victims are women and young children, as they spend the most time around indoor fires. These deaths are brought on by IAP-related diseases such as bronchitis, emphysema, and asthma. 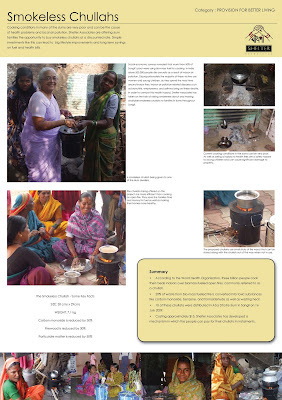 (Information from envirofitcookstoves.org). In order to combat this health hazard, Shelter Associates has taken on the task of raising awareness about and making available smokeless chullahs (stoves) to families in slums throughout Sangli. These chullahs, acquired through ARTI (Appropriate Rural Technology Institute), are incredibly durable, practical, and greatly reduce toxic emissions and fuel use – directly benefiting the health of women and children. Costing approximately $15, Shelter Associates has developed a mechanism in which the people can pay for their chullahs in installments. Abha Dhotre is an area in Sangli that first took the initiative of ordering smokeless chullahs in bulk. These chullahs were presented in the community on 16 July 2009. The meeting was attended by the self-help group on savings, Pratima Joshi (Executive Director of Shelter Associates), Lata Shrikhande (Associate Executive Director of Shelter Associates), Mr. Pravin More, Mr. Vivek Raman, Mr. Ravi (with WSP from the World Bank in Delhi), Sharda Kamble (president of the savings groups Shivan and Omkar), and Sunita Patil (the local corporator). In addition, the meeting was attended by more than fifteen women of Abha Dhotre and their children, along with Shelter Associates’ members from Pune and Sangli. The meeting was held at the Urdu Madarsa primary school that serves as a community center during the off-hours. While the women were happily receiving their new chullahs along with lemongrass bulbs gifted by Shelter Associates in homemade recycled paper bags, tea was prepared outside on one of the smokeless chullahs! Pravin More recalled his own childhood in a small village in Maharashtra where a smoke-filled kitchen was a common sight. He remembered his grandmother coughing away as she worked over her smoke-filled stove in the kitchen for the lack of a better alternative. Things just got worse in the rainy season as the wood would be damp. He appreciated Shelter Associates’ work as they are in tuned to the needs of the people. 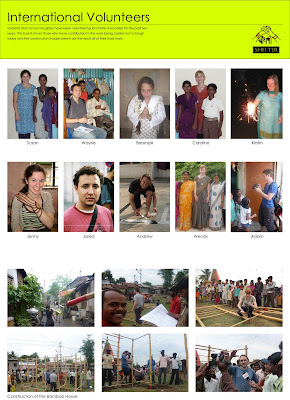 Mr. More has traveled all across the country meeting non-profits, local government bodies, CBOs, and NGOs. He has visited Shelter’s work in Sangli that was initiated nine years ago and is still in great working condition. He believes that when all stakeholders (i.e. the community, the NGO, and the local governance) work together to reach a common vision, there is no limit as to what can be achieved. Sharda Kamble expressed full faith in Shelter Associates’ social workers and their work with the community. Drawing classes, embroidery lessons, and savings groups have all brought the community members closer to one another. She recalled a public demonstration of the smokeless chullahs done by Shelter last month. One of her neighbors, Vidhya, has already bought a smokeless chullah and is happy to be cooking her family’s food on it. All the local cuisine such as bhakri can be cooked in this way. She mentioned that we tend to stick to our traditional ways regarding cooking, but technology and changing times can shift this tendency. She gave an example of Maghde, a middle-aged housewife, whose health has greatly suffered from the indoor air pollution of smoke-filled kitchens. She also reminded the women how often they get burned from operating a traditional chullah, suggesting that they be prepared for this change to smokeless chullahs. Sharda concluded by stating that whether she is around or not, the women can always count on Shelter Associates for giving good advice! As the people will be moving into multi-storied buildings, the traditional way of cooking on the wood stove will no longer be feasible. Pratima Joshi articulated this concern, taking into consideration the wish of the women to continue to cook traditional cuisine in their new housing settings. 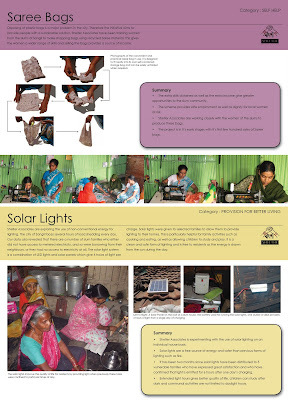 Using smokeless chullahs makes this possible, while drastically improving the health of the women and their families. Clearly, the time for smokeless chullahs is now, as traditions must be thoughtfully adapted to accommodate modern changes. 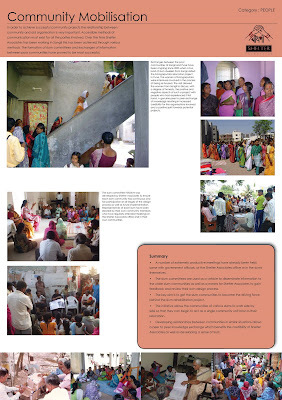 Sanitation Projects are an important part of Shelter Associates’ ongoing work in the city of Pune. Click on the picture below to read about one such project in the community of Shivrai Nagar, where more than 100 individual toilets have been constructed over the last five months. 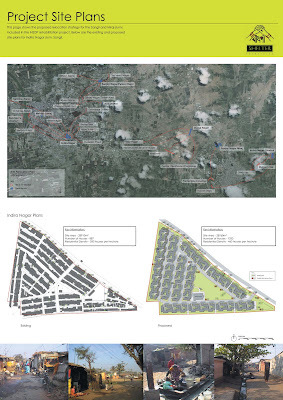 Although Shelter Associates were initially invited into the community to provide toilets, it quickly became apparent that this just was one of a number of issues facing the residents of this settlement. Working together with local people, Non-Governmental Organizations and the Municipal Corporation of Pune, Shelter Associates were also able to help residents of Shivrai Nagar with sewerage and waste collection. Following the success of work in Shivrai Nagar community workers from Shelter Associates have begun surveying neighbouring communities, where residents are keen to start similar sanitation projects. 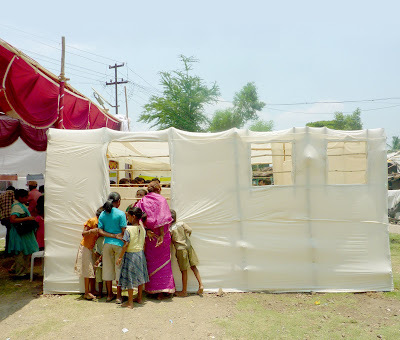 On 2nd May, a model house exhibition was held at Indira Nagar slum in Sangli. 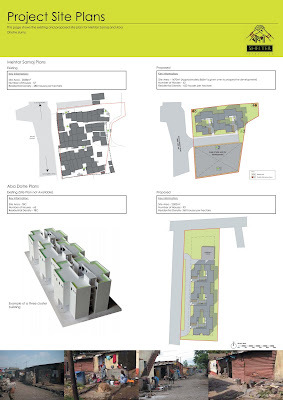 The aim of the exhibition was to illustrate the approved ISHDP scheme to the slum community and to give them an opportunity to experience 1:1 spaces within their tenements before they get built. 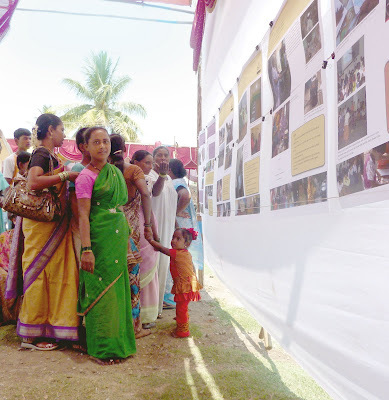 A gallery of panels were displayed leading to the model house that demonstrated the community mobilisation efforts of Shelter Associates over the last decade in various slums of the Sangli-Miraj-Kupwad Municipal Corporation. The exhibits also showed SA’s efforts over the last year in raising awareness about the IHSDP project not only in slum communities but also the general citizenry. 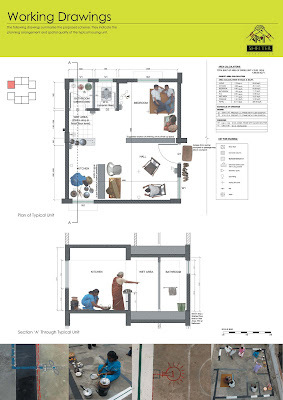 On this page you can find the panels that were exhibited on the day as well as a short film illustrating the construction of the model house on site at Indira Nagar. 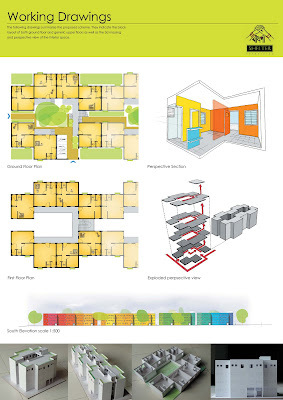 The aim was to allow the community to begin to experience their future homes at a scale that was meaningful to them. Over three hardworking days, Shelter’s team worked alongside members of the community to construct a 1:1 bamboo replica of a single apartment. 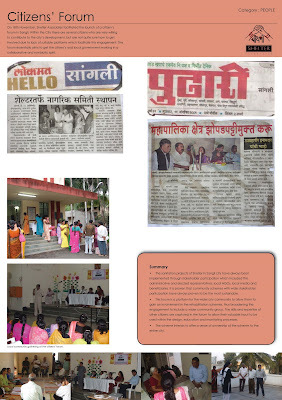 On 18th November, Shelter Associates facilitated the launch of a citizen’s forum in Sangli. 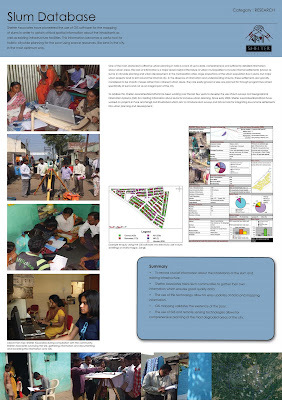 Earlier this year, the Government of India approved a project for the rehabilitation of 29 slums covering 3800 families (which is almost 50% of Sangli’s poor) and sanctioned a special amount of Rs. 95 crores under the IHSDP (Integrated Housing and Slum Development Programme) of the JNNURM (Jawahalal Nehru National Urban Renewal Mission). 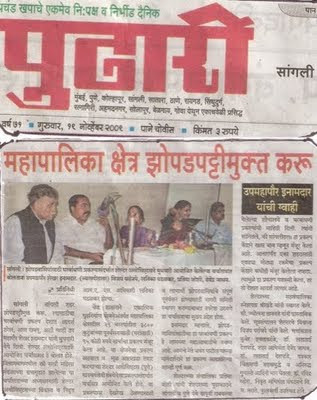 SA decided to facilitate a citizen’s forum in Sangli so that residents could play a more active role in the rehabilitation of Sangli slums. Often times, citizens want to contribute to their city’s development but are not quite sure how to get involved. This problem is especially acute in small cities like Sangli, which are already handicapped by lack of sufficient staff, expertise and funds. SA’s citizen’s forum remedies this problem by creating a platform through which citizens can work with the local government and NGOs to state their opinions and voice their concerns. At the end of the meeting a core committee was formed. Below is the local press coverage of this event.